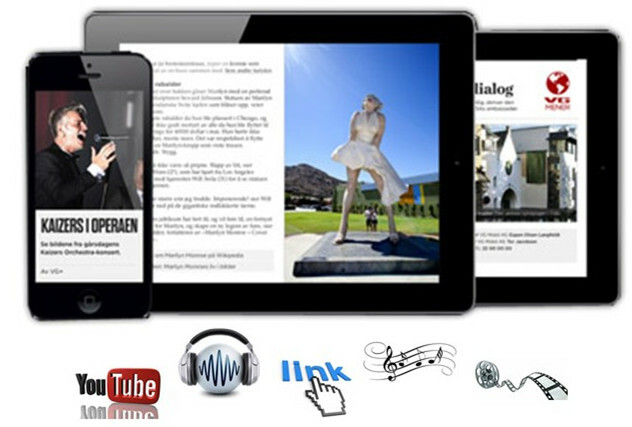 Try The New Cutting-edge PDF to HTML5 IPAD Magazine designer! It is easy for you to access to digital books online, but you may hardly access to digital books with real page sliding effect. PUBHTML5 was initiated to convert your original PDF files, pictures, or other office files into excellent page sliding digital publications. It is not simply a file converter, but a digital book designer that enables you to build your own exclusive digital publications with multiple designing tools. You may tremendously impress your viewers with your digital work created. Flexible publishing methods are available for you to choose to either online or offline publish your creation. 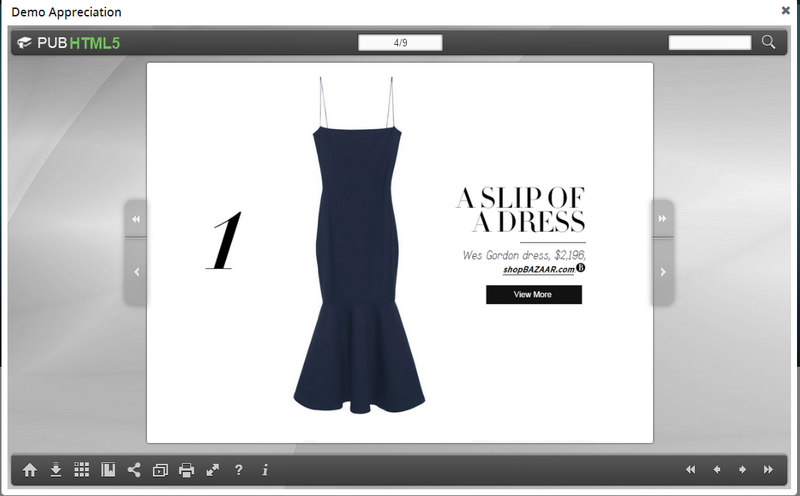 PUBHTML5 creates digital publication that brings intuitive viewing experience to its viewers. Compared with conventional PDF files, which is hard to be viewed and distributed before you have them downloaded, PUBhtml5 enables people to read fabulous digital books wherever they are, and whatever the electronic devices they prefer to use. See How incredible Effects It Has! PUB HTML5 allows you to create gorgeous digital magazine with default HTML format from your original PDF files (you may also chose many other exporting formats according to your own preference). PUBhtml5 also offers a cloud hosting service that allows you to online store and publish your digital work. We celebrate minimum service fees with maximum service quality. To meet the demand of different electronic users, especially IPAD, a chic tablet, pubhtml5 is designed to be able to create html project that could be viewed on mobile device after being created on PC. When you have designed your digital magazine and have saved it to local as pdf to html5 ipad magazine HTML format, your publication will be allocated with a URL which you may apply to open your digital magazine though web browser on your IPAD, or other mobile devices. 1. 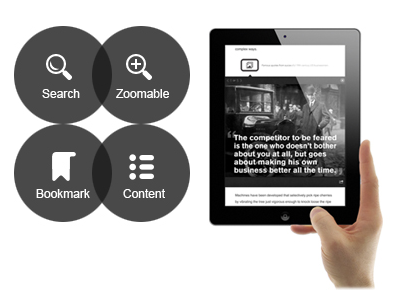 Your digital magazine will be enriched by various rich media embedding tools. If a digital magazine is created with page sliding effect, it’s good; If a digital sliding magazine can also present audios, videos, images, links, and other rich media, it’s perfect. Before you open your HTML digital magazine on your IPAD, you may use the page editor to customize your magazine with beautiful rich media effect. All the rich media can be well integrated into your work without leaving the impression that your magazine is interrupted by extra items. It’s been proved that viewers love it so much and can easily get engaged when digital magazines play audios, videos, and exhibit other media content. If you publish your digital magazine with business intention, a perfect digital magazine can greatly boost your web visits and increase potential clients. 2. 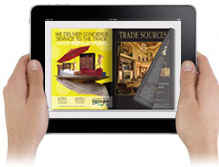 Your digital magazine on your IPAD will be searchable and zoomable. Simply by imputing specific key words, viewers can search the text they expect to read on the digital magazine. When you slide the pages, you can easily zoom into the page or specific text that especially attracts you. To better your reading experience, PUBhtml5 automatically creates a table of content based on your original PDF file when you select the IMPORT TABLE OF CONTENT option. 3. Your digital magazine can have a google analytics. Want to know web traffic conditions of your digital magazine? Here the chance! Use the custom setting tools to add google analytics to your digital magazine , and your may easily supervise the changes of your web visits. You may track to these statistics and make the brightest business decision!